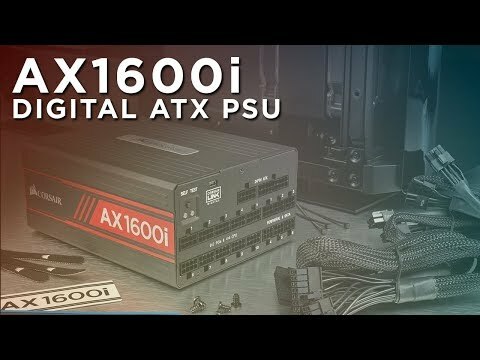 Product Overview The World’s Best PSU Gets Better! The CORSAIR AX1600i is the ultimate digital ATX power supply, built using only the highest quality components for unmatched performance and better than 80 PLUS Titanium efficiency. State-of-the-art gallium nitride transistors and 100% 105°C Japanese capacitors deliver 1600W of ultra-stable, ultra-efficient power, while the AX1600i’s digital design allows for complete control and monitoring in CORSAIR LINK software. Adjust fan speeds, switch between single or multi-rail overcurrent protection (OCP), or monitor your PSU’s voltages and efficiency. Zero RPM Fan mode ensures near-silent operation at low and medium loads and the fully modular, low profile cable set makes for easy installation and great-looking builds. It’s the ultimate PSU for the most ambitious PC builds. Features • 1600W of Ultimate Power: Delivers 1600W of continuous, ultra-stable, 80 PLUS Titanium efficiency power. • Top Tier Components: 100% 105°C Japanese capacitors, top-specification internal components and digital design deliver over 94% efficiency. • The Only Consumer PSU with Gallium Nitride Transistors: Totem-pole PFC Gallium Nitride (GaN) transistors for superior efficiency in a smaller form-factor. • World Class Electrical Performance: Incredibly stable voltages and ultra-low ripple noise. • Software Monitoring: CORSAIR LINK software provides in-depth monitoring for PSU temperature, fan speed, voltages, current, AC/DC wattage and efficiency, with the ability to log everything for easy troubleshooting. • Take Control: CORSAIR LINK lets you adjust cooling fan speed, RPM curves and switch between single or multi-rail overcurrent protection (OCP), all from your desktop. • 140mm Patented FDB Cooling Fan: Delivers low-noise operation even at demanding loads. • Zero RPM Fan Mode: For near-silent operation at low to medium loads. • Choose Your Colour: Three-color customizable magnetic side labels let you choose your PSU’s style to match your build. • Fully Modular Cables: Use only the cables you need for quick and easy installation. • Built to Last: Ten-Year comprehensive CORSAIR warranty.